The small business entrepreneur is an important part of the United States economy. Some of these entrepreneurs choose to go it strictly alone. Some choose to team up as part of a franchise. In the case of Monica Monaghan of Sun City Center, she has chosen the latter. The new Dollar Store is located in the Home Depot plaza just off S.R. 674 and Cypress Creek Boulevard in Ruskin. 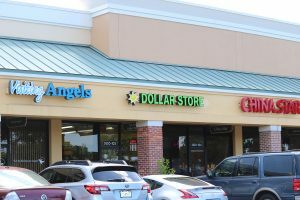 Since September 2018 Monaghan has been the proprietor of the Dollar Store in the Home Depot Plaza on S.R. 674 in Ruskin/Sun City Center. 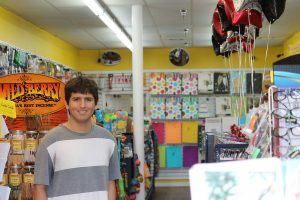 “We lean towards being a party and souvenir shop,” Monaghan said recently, while tending to the cash register at the front of the compact store. Monaghan also likes the socializing that goes with running a small store. “I love talking to people. I come across really interesting, beautiful, spiritual and remarkable human beings,” she said happily. “I lost count of how many times people have come to the store and not only complimented it but left the warmest wishes and prayers. They make my days brighter, and I, in turn, want to make them all feel welcome and appreciated. “What I hear from the neighboring business owners is mainly to ‘be patient’; there’s a lot of growth happening in the area and that is always good for business,” she said of her new venture.